Gemology is a field that requires non-destructive analytical tools in order to characterize the quality of a gemstone. Because of the ability of Raman spectroscopy to offer non-destructive, non-contact analytical measurements, Raman has become widely used for the characterization of chemical composition, the identification of authentic materials, the identification of enhancement treatments, and for inclusion analysis in the gemstone industry. 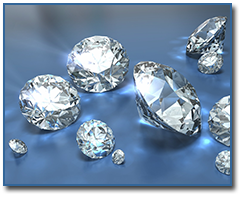 The use of fiber-optic probes can allow the characterization of gems in settings while the use of a Raman microscope can allow the identification of inclusions which can provide indicative information on the origin of the gemstone.